Corpse Killer is one of the last of the interactive movie games from Digital Pictures and guru Tom Zito. 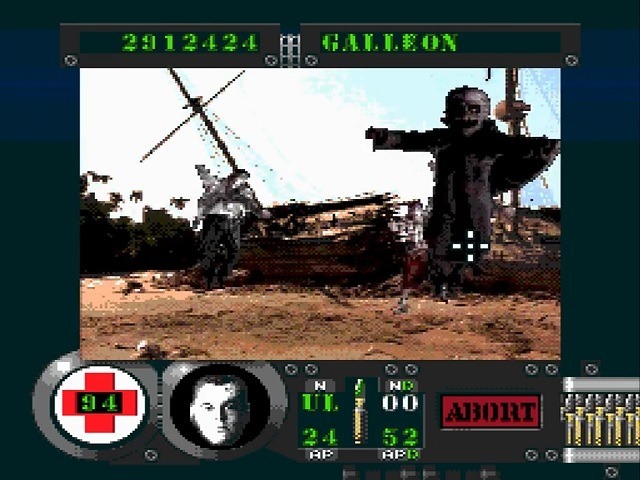 These games were their specialties, and really only continued by virtue of new console hardware – namely, the release of the 3DO, 32X, and CD-i; all of which were capable, if not outright designed to do a better job of showing live action video at higher resolutions. Devs in the early 90s really thought this was going to be the future. It didn’t help the quality of the games, but it does explain why they were still being made, and why they were still released on the wimpy ol’ Sega CD. Help Winston get an awesome hummer. Wait, that came out wrong. The name “Corpse Killer” gives you exactly the right idea about the subject of the game. 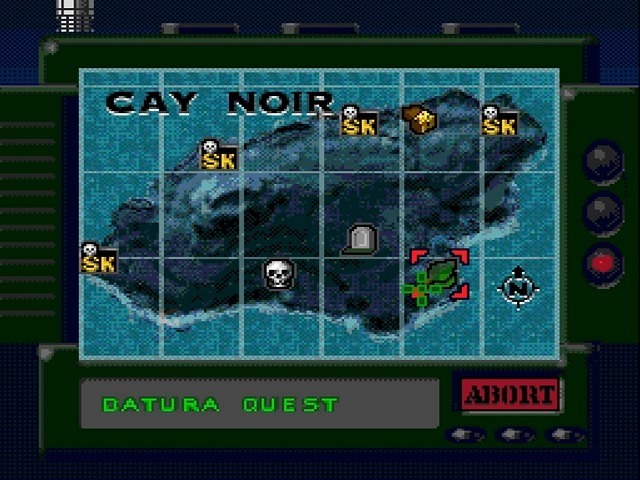 You’re a special forces Lieutenant air-dropped with a squad of four others onto the remote tropical island of Cay Noir. 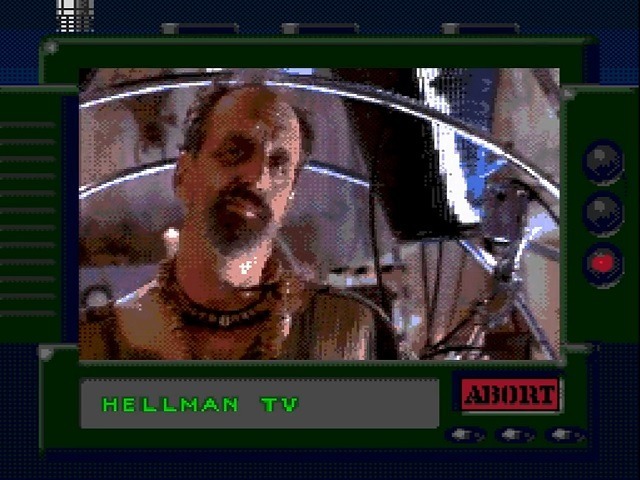 The details of your mission become more clear as the game progresses, but the idea is stop the mad Dr. Hellman, (played by veteran character actor Vincent Schiavelli) and his out-of-control research into creating an unstoppable zombie army for the United States. Your goal is to shoot through a never-ending supply of resurrected test subjects to rescue and un-zombify your four captured teammates, then personally take down Hellman. Assisting you throughout are a reporter named Julie (Brigett Butler), and a Rastafarian voodoo specialist named Winston (Jeremiah Birkett). Winston, endearingly, is only interested in finding enough pirate treasure to buy a Humvee. However, he is infinitely useful in providing you transportation, information, and voodoo brews. You can even have him read the future from chicken bones back at the base camp, and he will make appropriate suggestions as to which path to take – more on this later. Julie’s worthless by comparison. She rides around talking about her story, whines if you don’t help her out with her quests, and tosses out some inept sexual innuendos (“Neat gadget! I bet you know how to turn it on.“). They play off each other for some buddy-comedy laughs, and there is at least some entertainment between the zombie shooting. Gameplay breaks out into a series of linear shooting galleries. The camera always scrolls left to right for the length of about four screens, while zombies walk sideways, toward you from the background, or pull off amazing leaps. Your health and ammo are tracked at a standard display at the bottom of the screen, complete with a little image of your character that deteriorates along with your health. If any enemy makes it to the screen (or throws something that does) you take damage. You have four flavors of bullets cycled with the B button, though two of those bullets must be created using items you can sometimes gain at the end of missions. The C button will instantly abort your level and let you regroup. There are no pickups to collect or anything else to shoot; you simply fend off waves of zombies until you reach the end of the “gallery,” and automatically move on to the next video clip. Fading shadow men will either damage you if shot when black, or clear the screen of enemies if shot when white. The clever parts involve how the game breaks up and gives purpose to these shooting galleries. It’s a linear path, up until you save your first comrade. From here, Winston takes you to a graveyard that works as your base of operations. The graveyard lets you access your PDA, which holds backstory, information on items you can collect, Winston’s fortune-telling ability, and the map. The map shows all the various missions you can undertake. 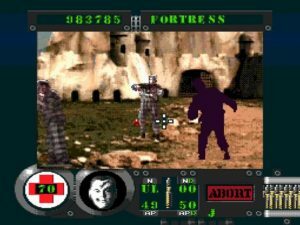 At any time, you can take on the central plot by selecting to raid Hellman’s fortress and rescue the next guy. Otherwise, randomized side quests will appear. You can choose to help Winston find treasure for his Humvee, or help Julie get some Pulitzer material. As far as I can tell, neither of these affect the end of the game. You can take quests to get armor-piercing ammo, or attack certain groups of zombies and get a random powerup as a reward. These all simply entail a single shooting gallery, but completing them gives you the item you came to get. You can even get ambushed before you make it to the mission, and having Winston read the bones will hint at the missions that will lead to such traps. It gives the game a level of strategy, and makes this easily the most elaborate FMV game I’ve played yet. It’s certainly a great leap forward from watching a couple video screens and hitting traps at the appropriate time, or selecting a list of witnesses and watching an uncontrollable video clip as you question them. It’s also the most like an actual game, despite still being hawked as a “U-Direct” interactive picture. You’re not simply following a linear movie order, or picking your next move out of a list; you’ll have to consider which mission benefits you best, and your shooting skill will help determine the outcome. You have to use Datura bullets to rescue your guys. You’ll also need to consider the Datura plant you sometimes get after missions. Datura, as Winston explains, has anti-zombie properties. It can either be used to give you powerful bullets, or as the only method to heal you. Each time you get a plant, you get a screen asking you if you want the bullets or the health. Both, as you can imagine, are awfully useful. Regular zombies can be dispatched with your infinite supply of standard ammunition. Special voodoo spirits can be too, but Datura is much more effective. There’s no time limit on when you have to hit the next plot mission, but taking side missions to build up a stockpile of Datura means you expose yourself to damage that may require you to use it on your health instead. Switching ammo types aside, the rest is basic arcade action. Your standard weapon is an automatic machine gun, allowing you to sweep the crosshair across the screen and cut down the hordes. 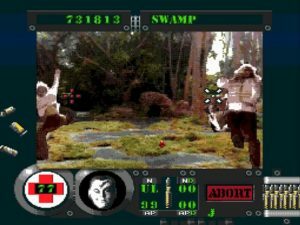 While video clips are used for enemies, every attempt has been made to keep this as action-packed as any non-FMV arcade gallery. This is much closer to Lethal Enforcers than something like Ground Zero, Texas, and the technical limitations of FMV feel removed in these sequences. You’ll see plenty of enemies moving independent of each other, and bouncing in from all sorts of hidey holes within each location. Of course, it’s not flawless. All of the zombie actors are shot on wires in front of a bluescreen. I understand wires for the huge leaps many take, but even the walkers appear to have been strung up and told to run in air. It results in a strange swimming look to everyone’s movements, and I can see people thinking it simply looks too hokey. Since these characters are simply overlaid on the scrolling video footage, it also creates situations where they ignore the foreground. The video is set up to have some depth of field, with totems or sheds sometimes passing by on multiple layers of distance. The zombies pass right through these. The developers have, at least, masked these zombies out if they’re “behind” something, but it still results in zombies suddenly running through solid walls, usually too close to you to react in time. The red crosshair marks where your bullets are currently going (while you’re still aiming elsewhere). Another smaller issue is that characters near the edge of the screen simply disappear if the screen is about to scroll past them. I kind of like it, since it was a lifesaver for me a few times. Practically, it means you should never waste your time shooting at enemies near the left edge. Control, unfortunately, is barely up to the task. You will be able to complete the game with even the pad controls, but none of the schemes can be called particularly ideal. For the control pad, the issue is the loose crosshair. You will be able to move around swiftly to deal with threats on either side of the screen, which will get you through the large majority of the game. You will not be able to pinpoint anything, or hold down a button to modify the cursor’s speed for more accuracy. This results in drawing a square around any small objects you’re supposed to hit, like thrown grenades or knives. The lack of real accuracy also means much of the game will be spend waggling the cursor around in a “spray ‘n pray” style. At least you have those infinite bullets. The game can also work with either of the Sega CD lightguns. Aiming becomes less of an issue, but lag does. The game puts a red crosshair on the last thing it registered as a hit, while your cursor continues on. So you can be shooting at your next foe, but if that red bracket hasn’t faded from the last enemy, then that’s the one the game is still thinking about. The effect of this is lag. Especially when multiple foes start swarming, you won’t be doing damage yet to the one you’re currently aiming at. I even had a few I mistakenly thought I killed, who shambled on to tag me for damage before the “queue” could catch up. Fortunately, the generous health you have (100 points, and each zombie takes 4 off) help to mitigate this, so a single blow will never be much to worry about. AP ammo is best used on these skull guys. They give off a bone rattle when you shoot them as a clue. The graphics, as is always the case with the Sega CD, are where most of the hurt is. It’s pixelated, it’s blocky, colors shift around frequently, and most of the beauty of the live island location gets lost to the system’s damnable cross-hatch dithering. Fortunately, it’s never unplayable. Characters never get lost in the backgrounds, though some thrown projectiles do. It can also be hard to spot special enemy types at a distance. But you will still be able to shoot impressive waves of baddies without dropping frames. Don’t get any other versions of this game expecting improved or easier gameplay; what’s here is good enough, and you’ll really only be getting better quality video for the plot films. Dialogue on these sections are at least clear, though Winston again suffers here. 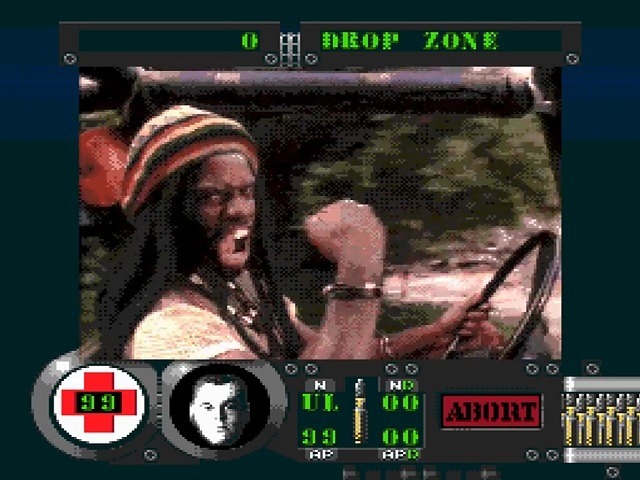 He speaks with a heavy Rasta accent, complete with “I-and-I,” which can make him hard to understand. He’s easily the best character, though, and Birkett seems to be having a great deal of fun with the role. Schiavelli seems comfortable in his typecast role, and hams it up to the appropriate levels. Butler is the outcast, both in-game and out, and she never quite feels like a member of the team. She certainly doesn’t pull her weight like Winston, and really seems to exist solely for you to stare awkwardly at her in a swimsuit as the game’s ending (yes, indeed). 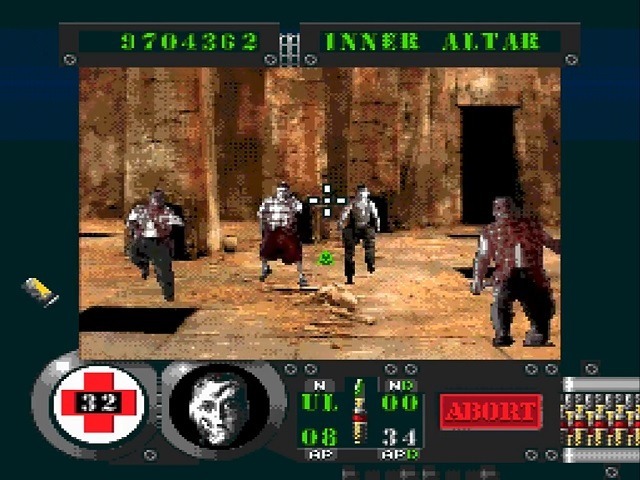 Corpse Killer is one of the shining examples of the genre. No wait, don’t laugh yet. Night Trap was the perfect introduction, and the voyeuristic gameplay made the most sense for telling a story in cinematic language while trying to maintain some level of gamer control. It didn’t translate to much of a game, and the second-generation titles tried to remedy that. You can see here how this is a standard arcade shooter, but with FMV targets and FMV cutscenes. It has enough “gamey” elements to make it fun, and the interactive movie parts support the game rather than attempt to replace it. That is about the nicest thing that can be said for such “interactive movies.” It’s really your call as to whether you want to consider that praise or not. An average game created with FMV features, rather than a bad movie lamely masquerading as a game. Shooting galleries generally work. Winston is as fun a partner as Ghost was in Sewer Shark. Strategy elements make this a deeper game than most of its ilk. Lag in the shooting secions, presumably due to technical limitations (and seemingly only present in the Sega CD version), mean other lightgun games do it better. Awful “boss fight” and worse ending. Cheesy as any FMV game, so come prepared. Does anyone know if there actually is a subtitled version? I’m pretty sure Wikipedia’s claim that Winston had optional subtitles in the 3DO or Saturn versions is wrong. I had this info in the review too, but can find no proof.